Mega Menu Builder Build personalized multi-column mega menu in seconds! Place images, tags and links and align it left, right or center. Form Builder Create Contact Form, Comments Box, Login Form or any other form very conveniently. Define any number of fields and ascribe specific functionality to each. Footer Grid Builder Divide the footer space into smaller or larger grids, depending upon the number of widgets you want to place there. Side Header Template Your modern agency and portfolio websites need a side header. 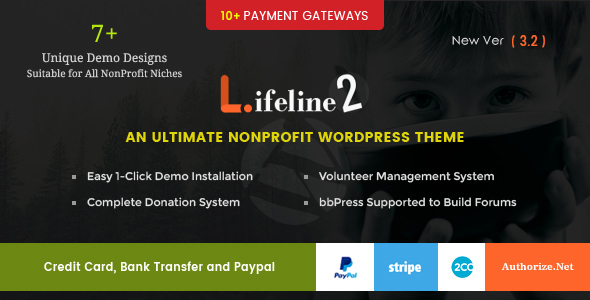 Use innovative vertical header that is provided with toggle and other amazing features. Auto Update Theme You need not be installing updates manually. With our auto update system, an update theme and plugins gets automatically installed as soon as it is launched. 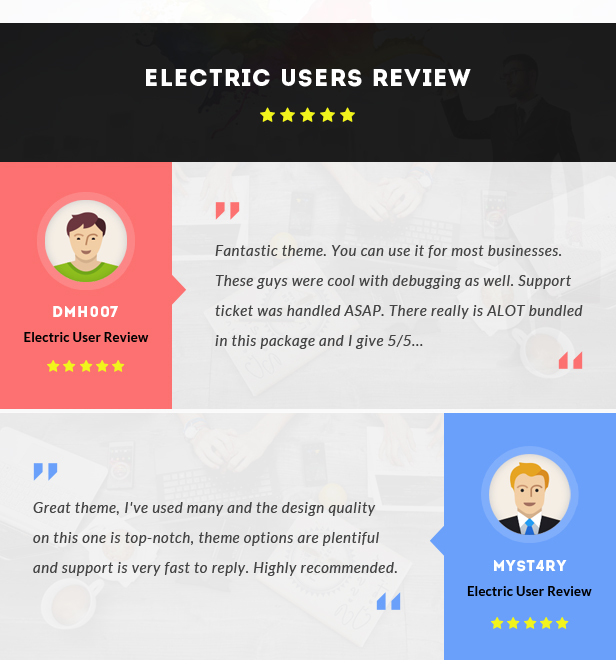 Single Click Demo Installation The complete data import of Electric theme demo can be accomplished in a single click! Online Documentation Supported with pictures, videos and step by step procedures, the online documentation of Electric has been made incredibly easy for newbies. Boxed And Wide Layout Any homepage version can be switched between boxed and wide layout with a click. For boxed version, you have very attractive backgrounds. You can also define and apply your own. Custom Table Graph The flexible Custom Table Graph has been decorated with unique color blending. It can be made smaller or larger and showcased in any sized grid. Parallax Background Facility Every single section and shortcode has been empowered to display a parallax background to give your content a perfectly dynamic look. Color Scheme Definer Beside the extremely cool and catchy color scheme, offered as default, we have integrated Color Picker tool. So you can define unlimited color schemes, each with a click! Sticky Header Feature The semi-transparent sticky header not only beautifies the look of the webpage but also adds to the ease of navigation. Even while on bottom, you can switch to any other page without scrolling. Advance Footer SettingsThe advanced footer settings allow you to place different built-in useful widgets and define specific grid dimensions for each. The dimensions of widgets get auto aligned with smaller or larger grid sizes. social Media Manager With powerful social media manager, you can remove, replace or use an icon from the Font Awesome collection quite easily. Advance Blog SettingsUtilizing the advanced blog settings, you can change icons, rearrange sections, apply sidebar with widgets, customize layout and enable/disable any feature on the page. Sidebar Builder Build a beautiful sidebar with the shortcodes and widgets of your choice. Each of the dozens of predefined widgets is fully functional and has potential to auto resize to fit in sidebar. Advanced Featured Area OptionsTo add to the decency of Featured Area, you can use Layer Slider, Kenburns effects, Text Carousel, Featured Text with Pictures and an elegant Video Background Slider. 10+ Portfolio Styles for Home Pages and Inner Pages We have invested maximum focus and energy on making the 10+ portfolio layouts as stylish, unique and powerful as possible. So, you will find each full of features and functionality. Vertical and Horizontal Menu Traditional horizontal header has been presented with a touch of novelty both in outlook and featuring. Electric also brings outclass vertical header with toggle and other awesome features. layer Slider With Layer Slider, it really exciting to build multi-layered, fully animated slides with hundreds of transition effects. The plugin is fully responsive and very easy to work with. 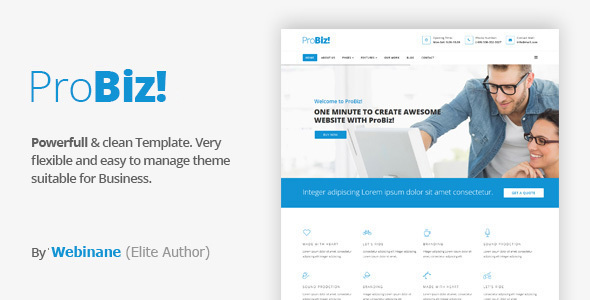 Visual Composer Besides giving you amazing power at the backend, VC page builder renders the pleasure of frontend editing. Through ‘drag & drop’, you can quickly customize every single detail of your website. Portfolio managment Besides making portfolio management extra easy and totally hassle free, it gives versatility through 10+ unique portfolios. 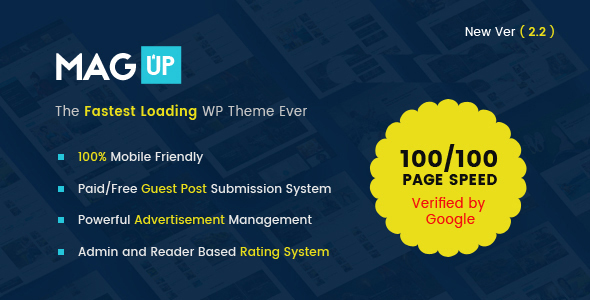 There are multiple styles for feature arrangements and detailed single page popups. Service Management Like other aspects of the theme, services management has also been made quick and convenient. 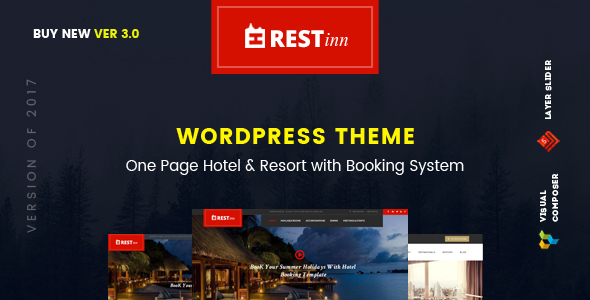 You have full-fledged pages for Services and Single Service, each equipped with redefined parallax effects. 6+ Header Styles Electric offers you over half a dozen header styles. Each of these is an epitome of power and brilliance and can also be made sticky. There is also a vertical or side header with toggle and other great features. 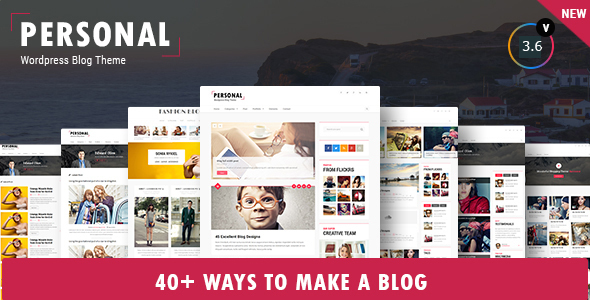 Dozens of Widgets Adding to the versatile functionality of your website, we are providing you dozens of powerful, ready-to-use widgets. You can place them not only in sidebar but also content area and footer. Fixed – Styling issues from backend and front end fixed. Fixed – Order Form working issue fixed. Fixed – Active tab issue fixed. Fixed – Color scheme option bug fixed. Fixed – Popup issues fixed. Fixed – Video play issue in video widget fixed. 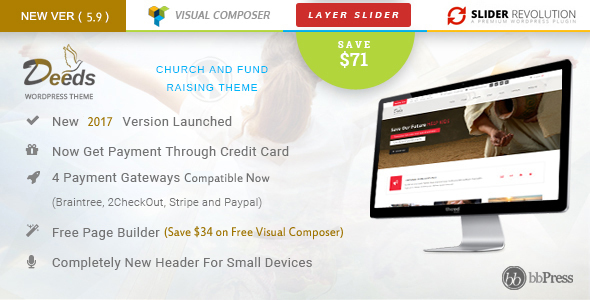 Updated – Visual Composer Updated. Updated – WooCommerce Files Updated. 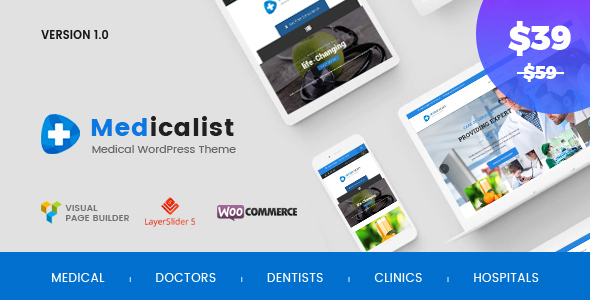 Updated – WordPress Compatiblity with Latest Version 4.8.2. New – Construction Demo added. New – Business Blog Demo added. New – Modern Blog Demo added. New – Business Agency Demo added. New – 15 new shortcodes added. New – New side header template added. New – 2 new header styles added. Fixed – Responsive menu issue fixed. Fixed – Counter jQuery issues resolved. Fixed – ‘Our best client’ shortcode issue fixed. 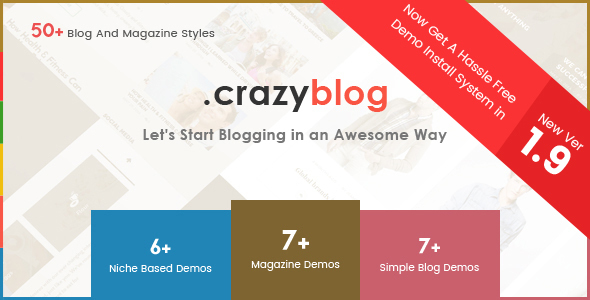 Fixed – ‘Our blog list style2’ shortcode issue fixed. Fixed – Single portfolio issue fixed. 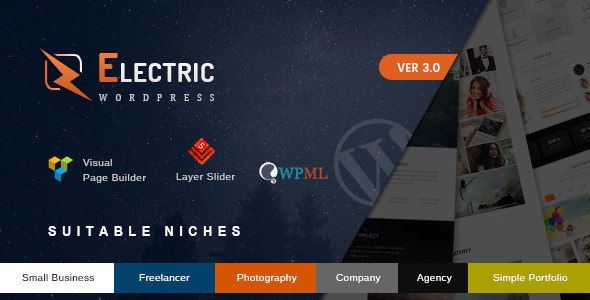 Fixed – ‘electric-about’ widget logo issue fixed. Fixed – ‘electric-gallery’ shortcode issue fixed. Fixed – Footer bottom custom color issue fixed in theme option. Fixed – Default copy right issue fixed in theme options. Fixed – Demo installation issues fixed. 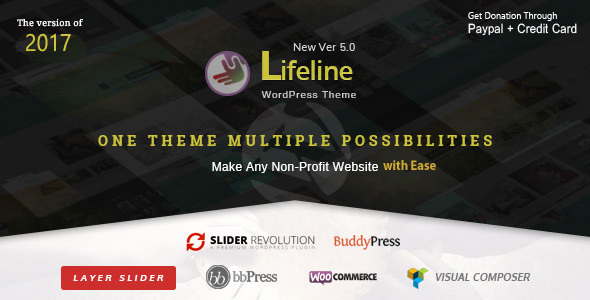 Fixed – Header styles issue fixed in theme option. Fixed – Layerslider styling issues fixed. 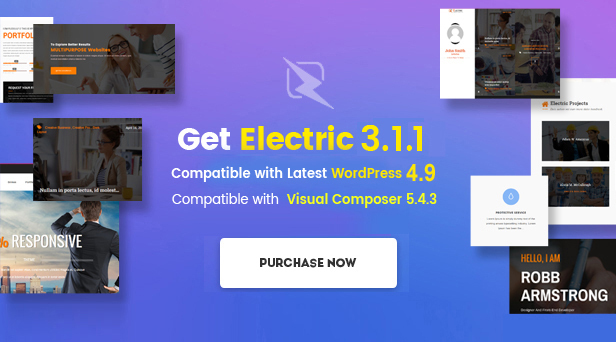 Updated – Compatible with updated WooCommerce 3.0.8 plugin. 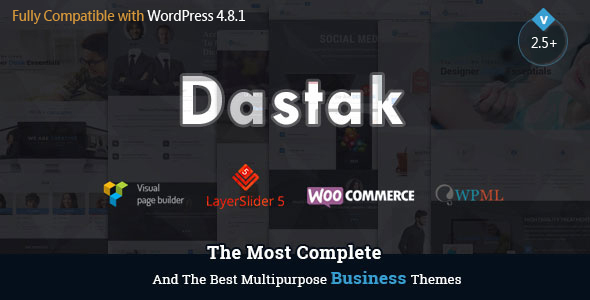 Updated – Compatible with latest version of WordPress 4.8. 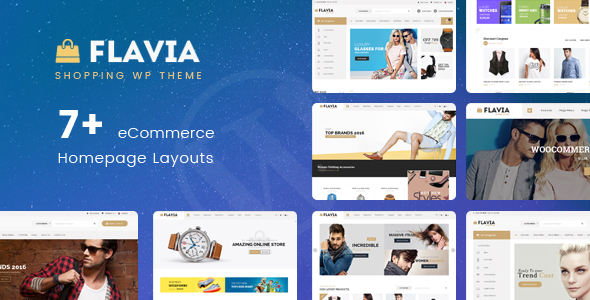 Updated – Outdated Woocommerce templates are upto date. Updated – TGM Plugins installer updated with their latest version. New Option – Add New Option: Hide/Show Service detail banner. Changes – Social Media Icon in header will be opened in new tab. Fixed – Product Gallery Images problem.